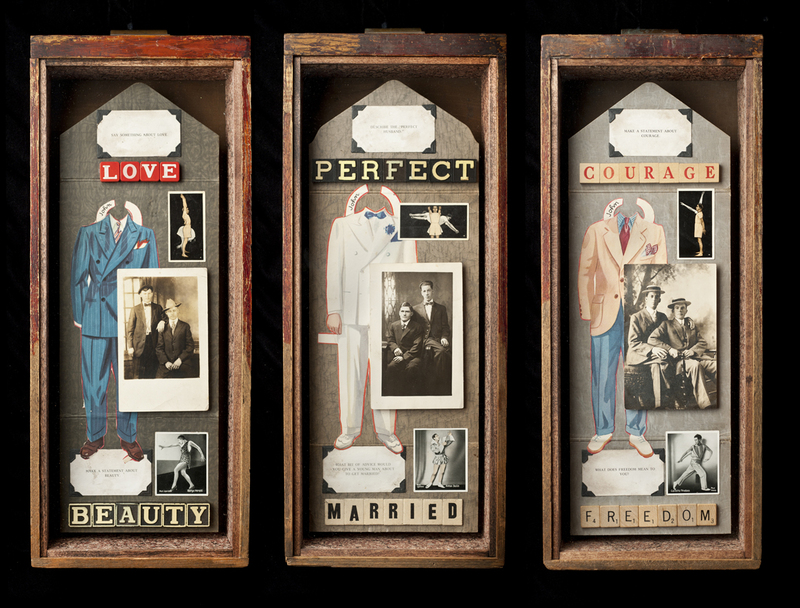 As an artist of the 21st century, and carrying my own set of longings and fantasies as well as a growing knowledge of Queer Theory, I have chosen to make much of my recent assemblage and collage work about gender identity, sexuality, and LGBTQ social issues. 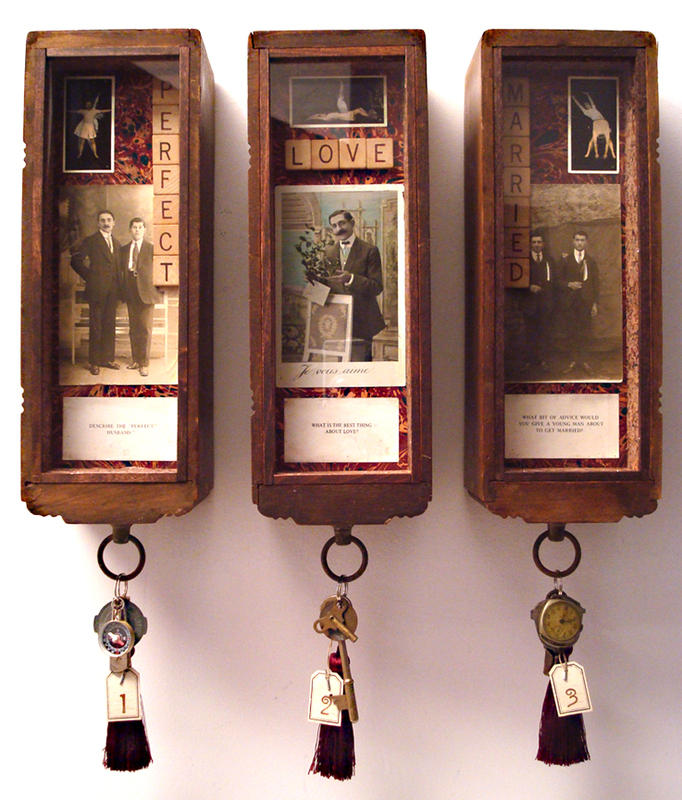 A recent series used the issue of gay marriage as its theme. 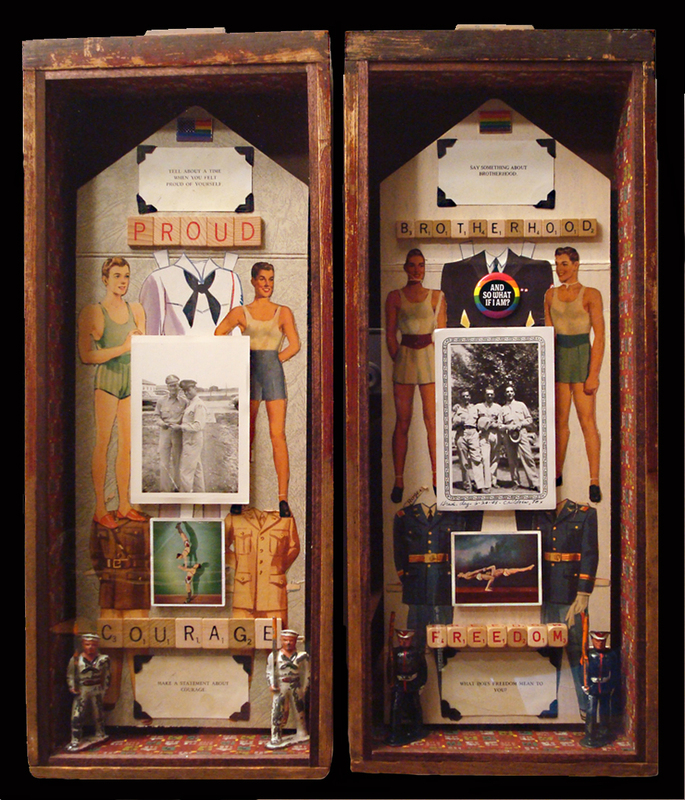 The boxes I used for this series, titled Gay Day, were old, found wooden drawers which were meant to represent the closet–because drawers, like closets, are places for concealment and invisibility. 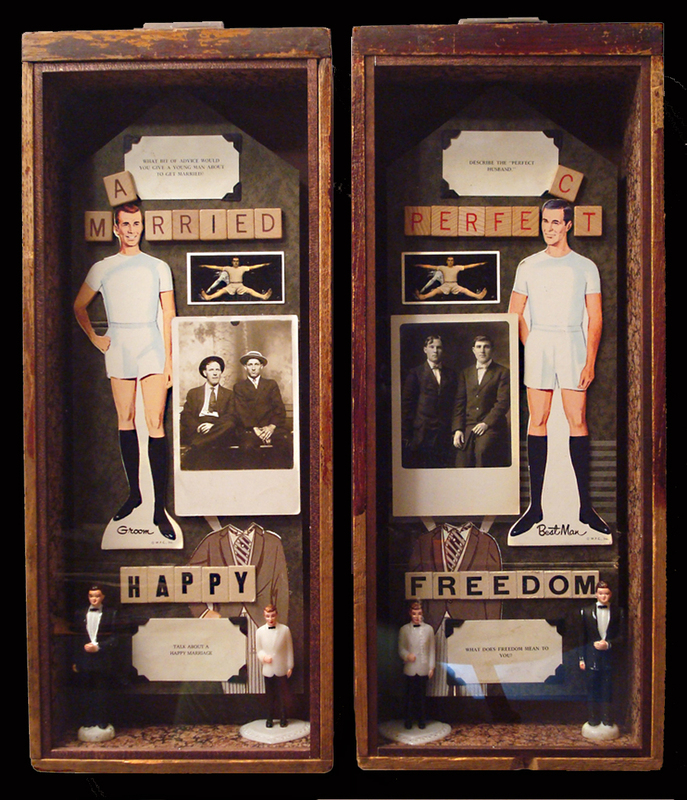 In the assemblage piece, “Marriage Diptych”, two drawers contain a pair of vintage 1950‘s bridal paper dolls, the groom and best man, dressed in their underwear with their paper tuxedos in the background. 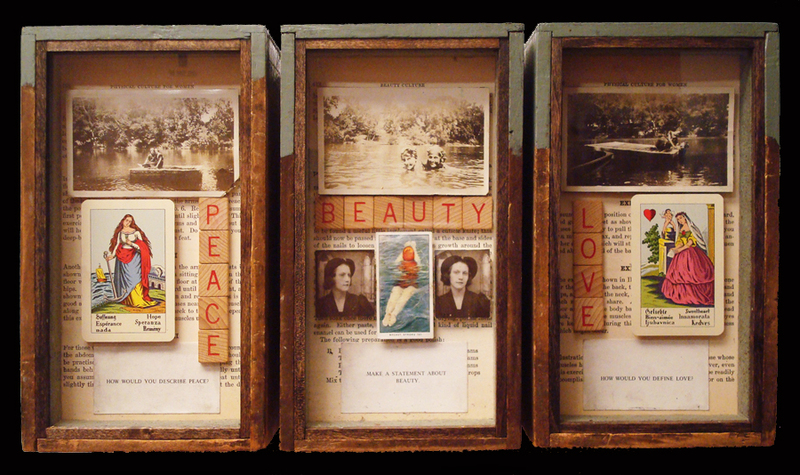 There are a pair of early 20th century sepia- toned photographs of affectionate male couples, a pair of cigarette trading cards with images of a man exercising with his arms and legs spread wide open, 2 pairs of plastic grooms wedding cake toppers, and the words MARRIED, HAPPY, PERFECT, and FREEDOM, spelled out in Scrabble and anagram tiles. There are four cards about the size of a standard business card—a pair in each drawer. They are from a 1970’s board game, The Ungame created by Rhea Zakich in 1972 as a non-competitive communication game to teach the sharing of personal thoughts honestly as well as how to listen respectfully–a kind of 70’s style group therapy/get to know each other/consciousness raising game for families. There are a stack of cards with various questions meant to elicit conversations about different topics especially around family, marriage, patriotism, and the Bible. 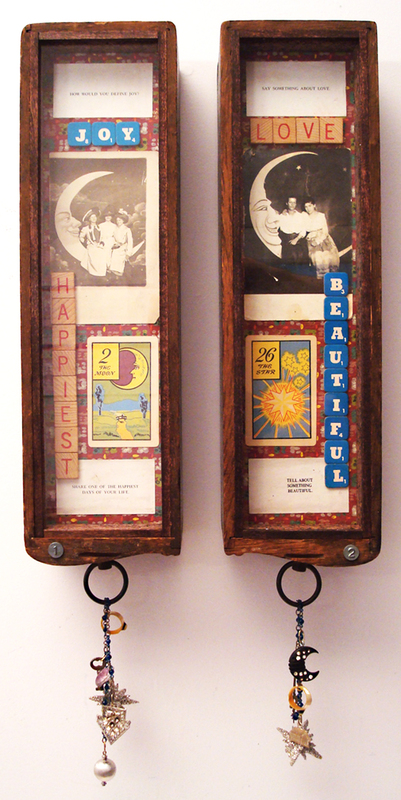 The four questions in this diptych read “What advice would you give a young man about to be married?”, “Talk about a happy marriage.”, “Describe the perfect husband.”, and “What does freedom mean to you?”. When I found this old game at a thrift store, I noticed the graphics on the lid of the box had a seal of approval by Dr. James Dobson and a white dove and crucifix denoting that it is a Christian Version of the game. Dobson, I remembered, had gone on to found the anti-gay hate group, Focus on the Family, in the 1980’s. A right-wing Christian activist, James Dobson has a long history of homophobic rhetoric and his group is known for fighting against equal rights for LGBTQ minorities, including gay marriage, anti-discrimination policies, etc. 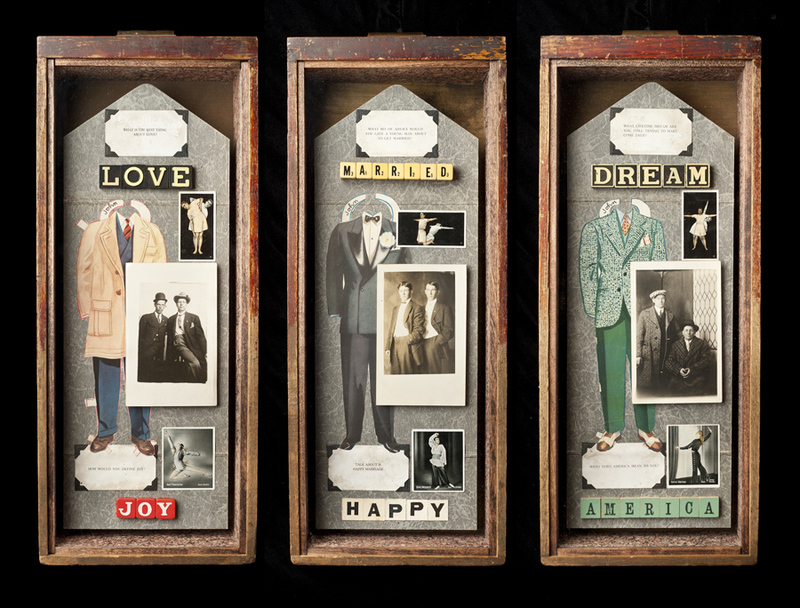 When I found this, my heart jumped for joy, as the questions on the cards worked so beautifully with the pieces I had been creating about gay marriage. It also explained the family oriented slant of the questions from the game. A double bonus, when I realized the homophobic James Dobson had given the game his seal of approval, because I would be appropriating these Dobson approved questions for the cause of gay marriage and LGBTQ families–not his original intention. I queered the game cards by putting them with the male bridal couples, the photos of affectionate men, and the plastic pairs of grooms. In this context, the questions take on a new meaning, in a sense they are re-written and re-contextualized to become questions about the definitions of marriage, family, freedom, and happiness and who is entitled to them in the 21st century.